Need to quickly find the right image? Searching through large collections using keywords can yield hundreds of results. Sometime just using search terms doesn’t get you quite close enough. 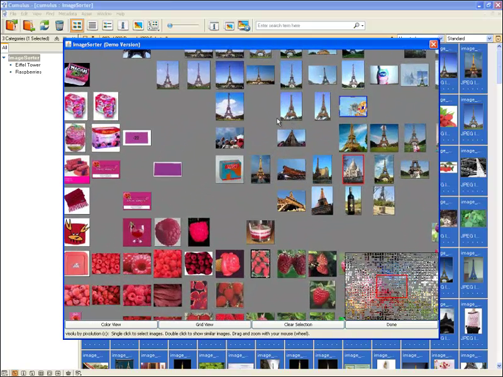 ImageSorter makes searches faster and easier by grouping pictures according to color, brightness and visual content. This gives you a quick overview of the relevant photos. The cursor can be moved in all directions, so you can expand the display, without having to switch between views. Just click to zoom in on the images and select the matching ones. You’ll be able to view the selected photos in the light box and view all the metadata. It’s the fastest way to find images based on visual content. The ImageSorter is available as an add-on to Web Module. Contact us for more information about ImageSorter.